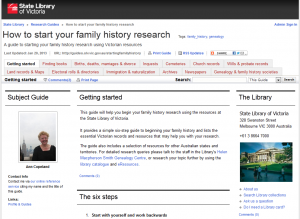 The How to start your family history research guide has recently been expanded and updated to include detailed information on how to find Victorian genealogy resources. It is ideal for anyone new to family history research or for those interested in identifying what resources are available in the State Library of Victoria’s Genealogy Centre. This is a work in progress. If you would like to suggest any other information sources or approaches to the topic please leave a comment below. Don’t forget that there are also many other excellent research guides available on the State Library of Victoria’s website. Here are just some of the family history guides.